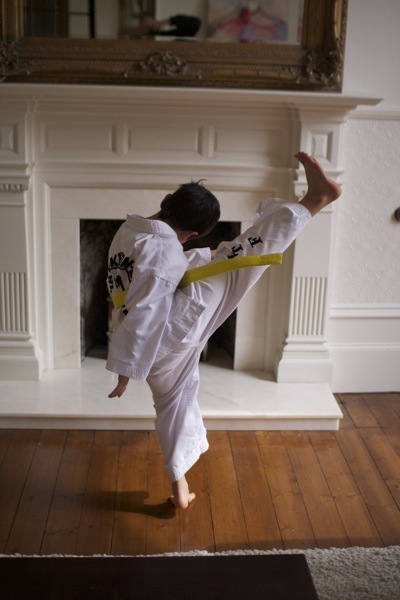 The wee man has now started Tae Kwon Do. It started because everyone else his age seems to have a half dozen improving evening classes, and we felt sheepish to admit he had no interests outside ours. It's been 9 months now, and we've seen some improvement in him: he seems more confident, and more focussed at school, and more respectful of authority. In my view, the key ingredient is not the quasi military nature of martial arts training, but the personal qualities of the teacher. He teaches in a very male way - he shouts, he gets cross, he makes jokes, he high fives their triumphs, he bops them gently on the head, he makes them do press ups. Given that fatherlessness is so closely correlated with delinquency, the female led (and unless the school's careful, the female orientated) nature of primary school needs a counter balance.